“Our goal was to give hotel guests a nostalgic understanding of the industrial past, mixed with today’s modern sophistication,” said Meaghan O’Neil, director of design for New Hampshire-based Colwen Design & Purchasing. The spacious lobby-living room of the recently opened Row Hotel was buzzing. Families, business people, couples, friends, and international visitors gathered at the bar, clustered in cozy corners, lounged on sofas, and worked at tables. The scene was dynamic and warm. It was midweek, and the hotel was sold out — all 158 rooms and suites. 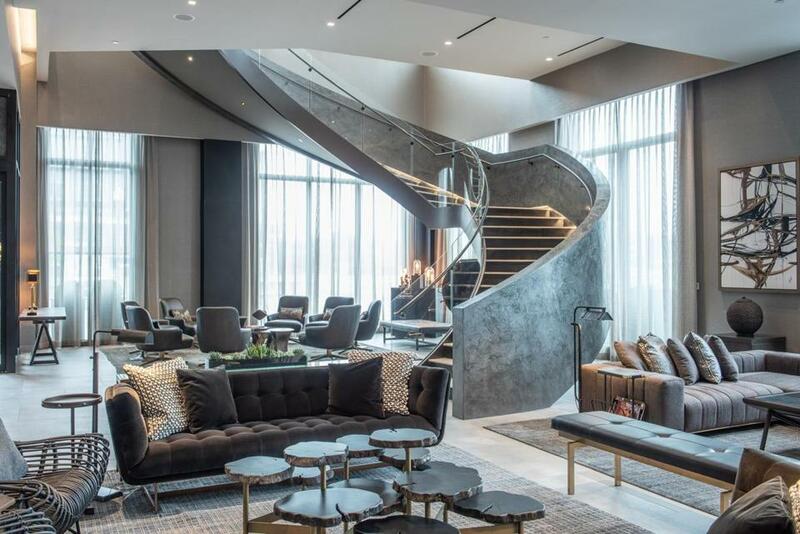 The site-inspired, contemporary hotel, which opened in August in Somerville’s fast-emerging Assembly Row neighborhood, is a welcome addition to the Boston area hotel scene. We expected it to be sleek and modern, with its mix of textures, bold industrial features, polished materials, and high-tech elements. We didn’t expect the warm, home-away-from-home vibe. The blend is tough to achieve, and will appeal to travelers looking for unpretentious luxury, and authentic, story-telling design. The building design and finishes, done by New Hampshire-based Colwen Design & Purchasing, pays homage to the former Somerville Assembly, a Ford Motor Company factory that was located here from 1926 to 1958. The expansive lobby serves as a check-in area, public gathering space, restaurant and bar. Tall, floor-to-ceiling windows let in light, while an ultra-modern spiral staircase, edged in glass and galvanized metal, is a focal point. Old and new are juxtaposed again in the dark heavy metals and concrete-stamped porcelain floor, set against white polished quartz, antique mirrors, and vintage lighting. The large table at the check in counter was hand crafted from an old factory lift. Just about every detail has been designed to harken back to the location’s industrial past. It may be a bit overdone: napkin rings that mimic gears! Table legs repurposed from factory machine parts! Bow ties! (Henry Ford liked to wear bow ties). But it’s more stylish than kitschy. The Row Hotel pays homage to the former Somerville Assembly, a Ford Motor Company factory that was located there from 1926 to 1958. There’s a spacious breakfast room, where guests can enjoy an upscale, euro-style buffet while seated in tufted, leather booths and chairs set against handcrafted wood and iron tables. The roomy 24-hour fitness center has top-notch equipment and on-demand video classes, and soon, a personal trainer who will consult with guests, and conduct regularly scheduled fitness classes. An adjacent indoor pool, surrounded by cabanas and lounge chairs, also has an outdoor deck (one of two outdoor terraces at the hotel). The change from the energized communal spaces to the guest rooms is palpable. The rooms are located off long, carpeted, high-ceiling corridors, lined with metal sculptures. It’s at once quiet and subdued. Rooms are spacious, bathed in deep gray hues and accented with dark wood furnishings. Each has a small sitting area, work desk, Smart TV, modern bath with walk-in shower, and a beverage center with a coffee maker and minifridge. 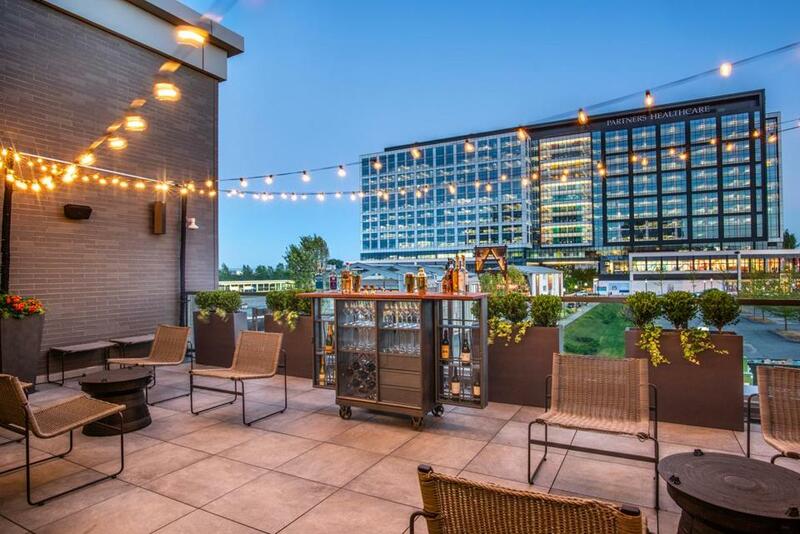 Next time you’re thinking of an overnight in Boston, consider a new possibility: a stay at The Row Hotel at Assembly Row, a short T ride from downtown, in a hopping neighborhood along the Mystic River. 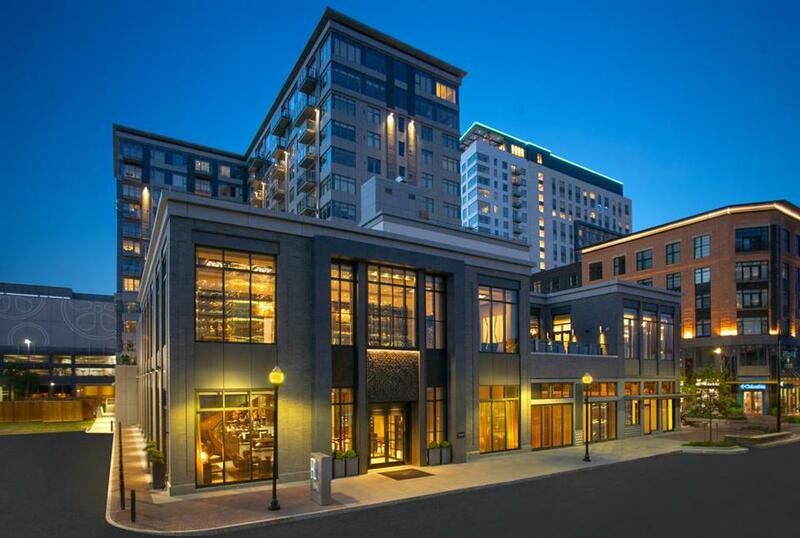 THE ROW HOTEL at Assembly Row is part of Autograph Collection Hotels and Marriott Rewards Program. 360 Foley St., Somerville, 617-628-1300. www.therowhotelboston.com; rates start at $279. The Row Hotel has two outdoor terraces.